Disorder of heart rate (slow: bradycardia or fast: tachycardia) or rhythm. Can occur at Sino-atrial node, Atria or Ventricles. Can be broadly split into tachyarrhythmias and bradyarrhythmias. PATHO: Problems with the Heart's electrical conduction system. CFs: Asymptomatic, Palpitations, Sweating, De-compensated (Low BP, LoC, Chest pain, pulmonary oedema), Syncope, Dyspnoea, Sudden Death. Ix: Best investigation is ECG. Note Bundle Branch Blocks effects ECG interpretation. 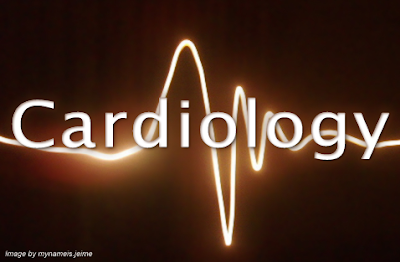 Read a Quick Guide to ECG to understand the basics behind reading and interpreting ECGs. FBC and U&E. Holter monitor, echocardiogram & coronary angiography. General Tx: Please note that these are very basic principles. Please seek the appropriate medical advice or the specific regimen that goes with certain arrhythmias.Lifestyle management including management of some modifiable causes, medications, electrical therapy (defibrillation, cardioversion, or pacing), insertion of pace-maker.